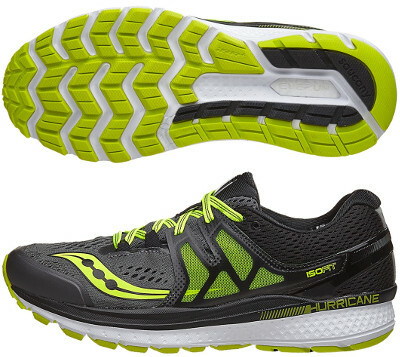 Saucony Hurricane ISO 3 are stability cushioned running shoes. The Saucony Hurricane ISO 3 follows the trend lead by its counterpart for neutral runners Triumph ISO 3 developing latest technologies from Saucony like EVERUN foam and simplified ISOFIT™ for better integration into upper. Hurricane ISO 3 is a great choice for daily workouts and long distances featuring top materials, plush cushioning and support for medium/severe pronation, definitely worth looking as alternative to popular Asics Gel Kayano 23. Upper gets completely updated from its predecessor Hurricane ISO 2 looking for improved comfort with a dual layer mesh in the forefoot which provides more breathability and redesigned ISOFIT™ system wrapping the midfoot which is better integrated into upper replacing plastic pieces with engineered mesh for softer feel. Heel counter is simpler and connect both sides of the shoe surrounding the heel for enhanced stability. As well as in other shoes from the american brand, EVERUN foam has been relocated to boost cushioning and energy return in rear aream something that will be appreciated specially by heel strikers. Classical medial post with firmer density foam is the selected approach for progressive pronation control. Outsole keeps materials (well known iBR+ and XT-900) although TRI-FLEX configuration changes slightly for increased flexibility to promote smoother transition.